Despite agreeing to a ceasefire with the Karen National Union earlier this month the Burma Army is transporting food rations, military supplies and reinforcements in the Myitta sub-township Tanintharyi Division that is currently under the control of the KNU’s Brigade 4. 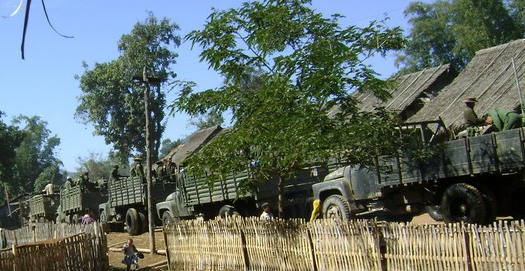 A Karen National Liberation Army source told Karen News that reinforcement – seven battalions from Burma Army’s Military Operations Command 20, Tactical Operations Command 1 and 3 were transported in 50 vehicles to the headquarters of Strategic Operations Command 1 at Yay Phyu village on January 29. Strategic Operations Command 2 sent 20 trucks filled with rations to the Myitta army camp to be used to restock their Iwine base. A military officer from the KNU’s Brigade 4 told Karen News. Keeping the recent good will surrounding the ceasefire agreement, Saw Kweh Htoo Win, the KNU chairman of the Mergui-Tavoy District, Brigade 4 said he sees the situation differently. Local villagers in the area confirmed to Karen News claims that they are being ordered by the Burma Army to carry its rations, using their own boats, so far 85 villagers from six villages in the Myitta sub-township had to obey the forced labor orders. A KNU military source told Karen News that the Burma Army’s, Lt Colonel Aung Kyaw Win, led Infantry Battalion 104 and Major Zay Ya Han lead Light Infantry Battalion 560 forces are in charge for the transportation route security that the rations will take. A Karen military source said the Burma Army is carrying out reinforcement and re-supplying its bases in KNU Brigades 1, 2, 3, 5 and 6. The KNU delegation and government representatives signed a preliminary agreement including a ceasefire at Pa-an, January 12. According to the preliminary agreement, the KNU and government delegations will meet within 45 days – the KNU plans to discuss the withdrawal of Burma Army from KNU controlled territory in order to build trust between the two sides.